Well, the first gen Panamera. Take one look at it and then try to look away. It’s not easy, trust us. 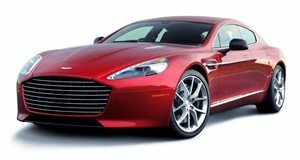 The 2017 Aston Martin Rapide S, the subject of our latest unboxing review, is perhaps the most achingly gorgeous super sedan on sale right now. It literally looks like a stretched DB9 or Vanquish. Essentially, that’s exactly what it is because all three are built on the same platform. Not only that, . The sound of 552 hp and 457 lb-ft of torque will make your day. However, those killer looks do come at a sacrifice: rear visibility. But honestly, who cares? That’s what backup cameras are for. Rear seat head room? Not the best, but again, it’s worth the sacrifice for a car that looks like this from the outside. The outgoing first generation Porsche Panamera, however, has a lot more rear seat space and better visibility, but it looks like a humpback whale giving a gorilla a piggyback ride. No offense, Porsche (and well done with the latest iteration). With a top speed of 190 mph and a zero to 60 time of 4.7 seconds, the Rapide S is the V12-powered, four-door earth-based rocket ship of your dreams. Buy one if you can. . Special thanks to for letting us film the car.